Breanni (Brian) recently had another exciting opportunity to speak with Lead Content Designer, Cory "Mumper" Stockton about... you guessed it, pets! If you missed the first interview back in December, click here to give it a listen. In this second interview, various topics were discussed, including the development and implementation of pets, plus some of your questions! A lot was covered and we couldn't even begin to list all the details in our highlights, so be sure to listen to the full 29-minute interview. We actually were able to sit down with Cory twice. Our first interview didn't record properly due to a technical glitch. We asked a couple questions during that first "lost" interview that we didn't repeat the second time around. When you try to find pets using the Auction House, there are two different filters – one for unused pet items, and another for caged pets that were previously learned by another player. Why not combine them into a single pet filter? This is something they'd like to do and it remains on their to-do list, but it's not a high priority. Before pet battles, pet quality used to indicate the quality of the item that teaches the pet. Whereas now, nearly everyone views it as the quality of a pet's battle stats. But that can lead to some confusion. For example, the Dragon Kite is learned from an epic item, but the pet itself has rare stats. Are there any plans to address this inconsistency? Cory agreed that it's a problem, though they aren't sure how to address it. They want to keep some pet-teaching items epic quality and it makes sense to give those pets rare stats. (Giving them epic stats would be overkill.) In addition, they haven’t heard from too many players that are upset or confused by this, so it isn’t a top priority. We'd like to express an even greater thanks to Cory for taking the time to redo the botched interview and chat with us (twice) about all things pets. So twice the thanks to you, Cory! 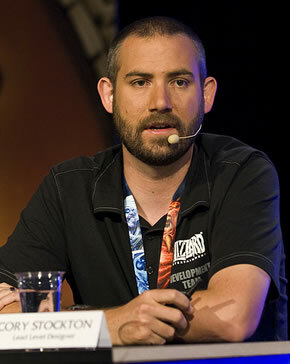 About Cory Stockton — As Blizzard Entertainment, Inc.'s lead content designer for World of Warcraft, Cory Stockton is responsible for overseeing the design and implementation of all exterior zones, dungeons, Battlegrounds, Arenas, and cities. He is also involved with many other aspects of the game, such as dungeon scripting and the Pet Battle System.